Use the eye-catching personality of this Courtney table lamp by Vienna Full Spectrum as a bold feature for any space. With a nickel finish, this Courtney table lamp by Vienna Full Spectrum evokes irresistible charm and personality. The decorative design features crystal and metal to create an eye-catching spark. The classic on-off switch is ideal for simple operation and functionality. 27" high. Shade is 12" across the top x 16" across the bottom x 11" on the slant. Courtney table lamp by Vienna Full Spectrum. Nickel finish; crystal and metal construction. 8-foot clear cord and plug. Net weight 6.6 pounds. 6 1/4" wide circular base. I like crystal but thought an all crystal lamp would be a little formal in my living room. This lamp strikes a good balance and I am hoping the nickel color will be all I think it will be. I was looking for a lamp that was a little more traditional looking in style. Don’t really like a lot of modern lighting. Crystal goes with everything and never goes out of style. This is a gorgeous style of lamp that I happen to love. My plans are to purchase another one to match in Mid March. I have shopped at your stores in the past. I have traditional American Colonial decor. These lamps should blend beautifully with the antique pewter and silver accessories I have in my kitchen/ family room area. is this lamp 110-220 v ? BEST ANSWER: This lamp is recommended for a standard 120V AC household current. 110v and 130v feeds will also be compatible. 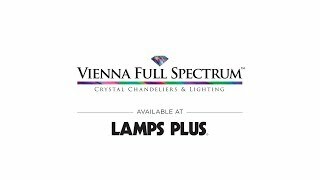 Can I use a 3 way bulb on the lamp....Courtney Nickel Crystal Lamp? BEST ANSWER: I'm sorry, this lamp is not designed for use with a 3-way bulb. If a design can use a 3-way bulb, you will see "3-way socket" or "3-way switch" listed in the product description or bullet points. For designs that don't have a 3-way switch, using a 3-way bulb will just make the bulb illuminate at its highest setting. For lamps that don't already have a 3-way socket, we recommend using a table-top dimmer to get similar functionality. Using a dimmer will allow you to easily adjust the bulb brightness as needed. Is the shade white or cream ? BEST ANSWER: The shades are a natural white. I have traditional bedroom furniture in my bedrooms, so I wanted something simple, classic and yet not overpowering. I chose this lamp for two reasons: price and looks. The quality was great for a bedroom. 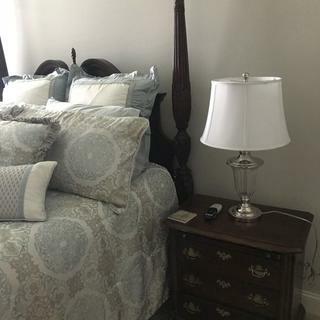 Actually, I bought the lamp before, I purchased the comforter for the bed. This was an excellent buy. My guest who have stayed in this bedroom kept commenting on the soft, elegant look of the bedroom. Love these lamps. Well made and the price for two was amazing. Look good with any decor. I had this lamp for exactly two days and was vey satisfied. Unfortunately, I lived in Paradise, CA so my home was destroyed in the Camp fire so I no longer have the lamp. lovely pair of lamps on our bedside tables. good height, light, and pretty to look at. I just received 2 of these lamps today for my living room. They are beautiful! They were packaged fantastically. I did sign up for message updates but only got the 1st one. I had to go to my account every day to check the tracking on my own. 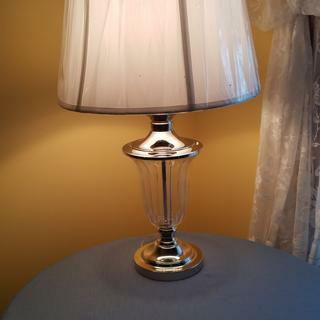 This lamp is a good combination of elegant and casual. It's not dressed up too much for casual living, but is classic enough for more formal rooms. Interesting curvesa classic patternand a crystal base help this porcelain accent lamp complete a traditional motif. Modern and glamorous style mixed into onethis crystal column table lamp is topped with a sleek gray drum shade.